You will be sent an appointment to see a Consultant ENT Surgeon, who will have cochlear implant experience. He/she will carry out an examination of the ears and assess your overall medical fitness. A CT scan will usually be required, since it is important to find out whether it will be possible to insert an electrode into your cochlea. The test is painless. However, you should not have it done if you think you might be pregnant or have recently had another CT scan. Some patients will be asked to undergo an additional type of scan, an MRI (Magnetic Resonance Image) to obtain additional information. Since this test involves the use of powerful magnets, you should not have this test done if you have any metal fragments in your body. You will, of course, have a number of hearing tests, and you may undergo a hearing aid trial. 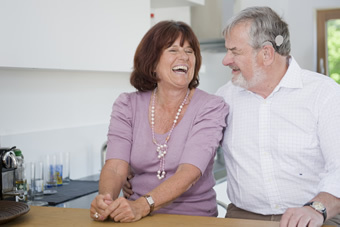 It is important to find out whether a hearing aid can offer more benefit than a cochlear implant. In some cases, the hearing aid trial can take many weeks or even months. Many people find that modern hearing aids are a great improvement over the aids that they tried years ago, and relieved to discover that cochlear implant surgery is not necessary. This special hearing test involves recording the electrical activity of your hearing pathway. It is useful for assessing people with profound hearing loss. Your responses are measured by placing small recording pads onto the head whilst loud clicks are played to you via headphones. You are required to lie still during this procedure, and you may even go to sleep if you wish! The procedure is painless. You may be asked to take part in an evaluation of your lipreading skills. You may be asked to watch a speaker on a TV screen who will say various sentences, and to repeat back what you have heard. You will be tested using lipreading alone and then lipreading and sound together. This will tell us how much you rely on lipreading to understand speech and how much your hearing aid(s) support your lipreading. We will also test your ability to understand speech without lipreading to evaluate your hearing aid benefit. These tests give us baseline measurements for later comparisons with your implant. In order to see if there are any changes in your voice quality after receiving an implant you may be asked to see a speech and language therapist. He/she will make a recording of your speech. This normally involves you reading or speaking a short passage which may be recorded. You may be asked to complete a number of different questionnaires. These are often administered by computer and your responses are recorded by an easy-to-use touch screen system. The questionnaires are an opportunity for you to tell us how you feel about your deafness, how you think it affects the quality of your life, and what you are expecting from a cochlear implant. All replies are treated completely confidentially. It is important to consider your psychological status before implantation. Some cochlear implant teams will refer you to a Clinical Psychologist or Psychiatrist. At this appointment you will be able to discuss your reasons for wanting an implant. Cochlear Implant Teams need to be sure that you fully understand about all that is involved in having a cochlear implant as well as establishing that your expectations are realistic. The purpose of these discussions is to help you to make up your mind whether or not you want an implant and whether you would really benefit from one.